Like the 160 lb Shaper, this too is an awesome anvil....with a very long face and horn...perfect for the blacksmith who desires a big anvil for big jobs. The heat treating is superb, providing excellent hammer return. The position of the pritchel hole and hardy leaves more room at the heel! It and the Shaper model are designed to serve both blacksmiths and farriers. 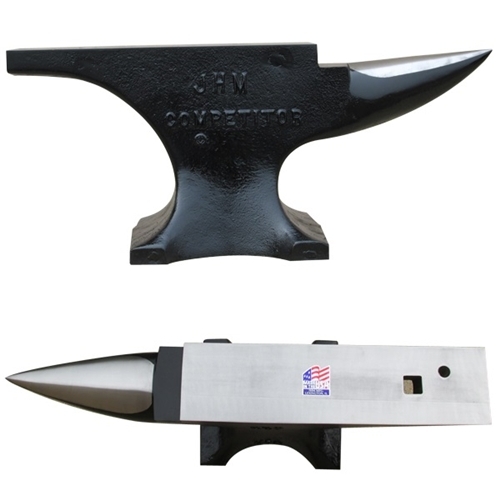 Both anvils have round horns - the Competitor has a shorter, fuller horn and the Shaper has a longer, narrower horn. Those who compete prefer the bigger Competitor because the face is wider, 5-inches, which works better for bigger, harder shoes. Many horseshoers have a shop, and they'll use a Competitor or a Shaper which doesn't have to be carried around, set up on a stump or a bench. Blacksmiths who make decorative items or other things besides horseshoes also prefer these larger anvils. Face: 20" X 5 1/8"
Base: 12 1/4" X 11 1/4"